My take: What a delightful book! Follow a year (or more) in the life of the Robin family. Hurley uses few words to guide the reader but not many are needed. The gentle illustrations in pleasing colors tell the story. Any young child and older reader will enjoy this book. I think it would be a perfect choice when looking for a book gift – I would give it as a “new baby” gift or to a new grandparent. 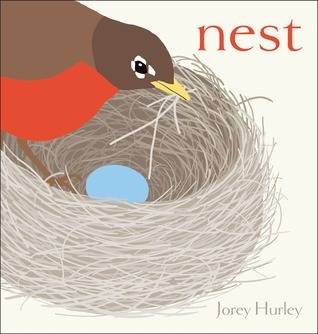 Nest would be a great addition to any home library. Ooooo I think we need this one. Yes, it would be perfect, Sheree! When is the baby due? Such exciting news! This book sounds like the perfect gift for me to give to my nieces’s new baby. I’d probably enjoy it too! This book is already on my radar. Glad you liked it.